'HORNCHURCH SCRAMBLE - THE HARDEST DAYS PART II"
On August 12th, 1940 the Luftwaffe turned their full attention to the RAF's forward fighter bases and radar stations with the intent to obliterate them once and for all. The outcome of the Battle of Britain hung in the balance. It was late in the afternoon of Sunday, 18 August 1940. The previous week had seen the hardest days of fighting in the Battle of Britain as the young pilots of the RAF Fighter Command had engaged in deadly duels with the Luftwaffe. Bystanders gazed cautiously upwards at the weaving contrails in the clear blue skies over southern England as they anxiously awaited the outcome. For just a moment, all was at peace: A gentle breeze floated across the airfield at RAF Hornchurch as the exhausted young pilots of 54 Squadron could rest for a few brief minutes and reflect on their own previous two encounters with the enemy that day. The Luftwaffe had thrown everything at them in the past few days, but today had been the toughest of them all. And then the calm was shattered by the shrill tones of the alarm, the Luftwaffe had launched another huge raid of over 300 aircraft across the Channel, and it looked like Hornchurch was the target. 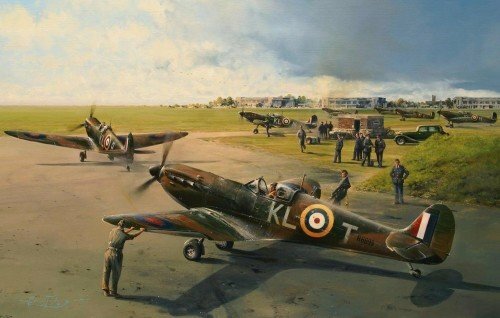 Robert Taylor's masterful painting, Hornchurch Scramble, portrays the moment as 54 Squadron's commanding officer, Squadron Leader James Leathart, taxis out at Hornchurch to prepare for take-off. Quickly following, the aircraft of New Zealander Colin Gray is guided out from dispersal by his ground crew. Gray would claim 3 Bf110s in the encounter and would eventually become the top scoring New Zealand Ace of the war. This historic new edition carries the original signatures of highly respected RAF veterans that flew in combat during the Battle of Britain. THE LIMITED EDITION Each print is personally signed by artist Robert Taylor, and individually hand-numbered; together with three distinguished RAF pilots who flew Spitfires in the Battle of Britain.